Globoid cell leukodystrophy (GLD) is a neurological disease caused by deficiency of the lysosomal enzyme galactosylceramidase (GALC). 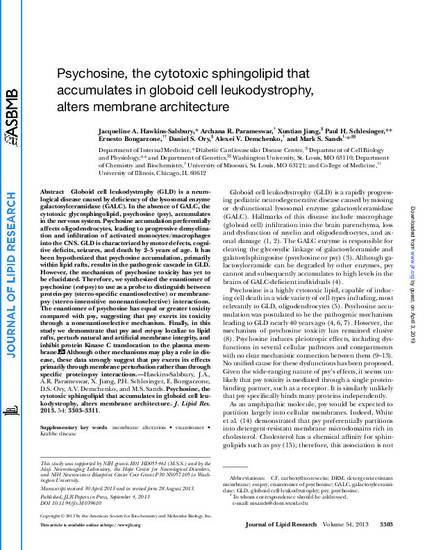 In the absence of GALC, the cytotoxic glycosphingolipid, psychosine (psy), accumulates in the nervous system. Psychosine accumulation preferentially affects oligodendrocytes, leading to progressive demyelination and infiltration of activated monocytes/macrophages into the CNS. GLD is characterized by motor defects, cognitive deficits, seizures, and death by 2–5 years of age. It has been hypothesized that psychosine accumulation, primarily within lipid rafts, results in the pathogenic cascade in GLD. However, the mechanism of psychosine toxicity has yet to be elucidated. Therefore, we synthesized the enantiomer of psychosine (ent-psy) to use as a probe to distinguish between protein-psy (stereo-specific enantioselective) or membrane-psy (stereo-insensitive nonenantioselective) interactions. The enantiomer of psychosine has equal or greater toxicity compared with psy, suggesting that psy exerts its toxicity through a nonenantioselective mechanism. Finally, in this study we demonstrate that psy and ent-psy localize to lipid rafts, perturb natural and artificial membrane integrity, and inhibit protein Kinase C translocation to the plasma membrane. Although other mechanisms may play a role in disease, these data strongly suggest that psy exerts its effects primarily through membrane perturbation rather than through specific protein-psy interactions.